Griffin was handed a certificate for his efforts. 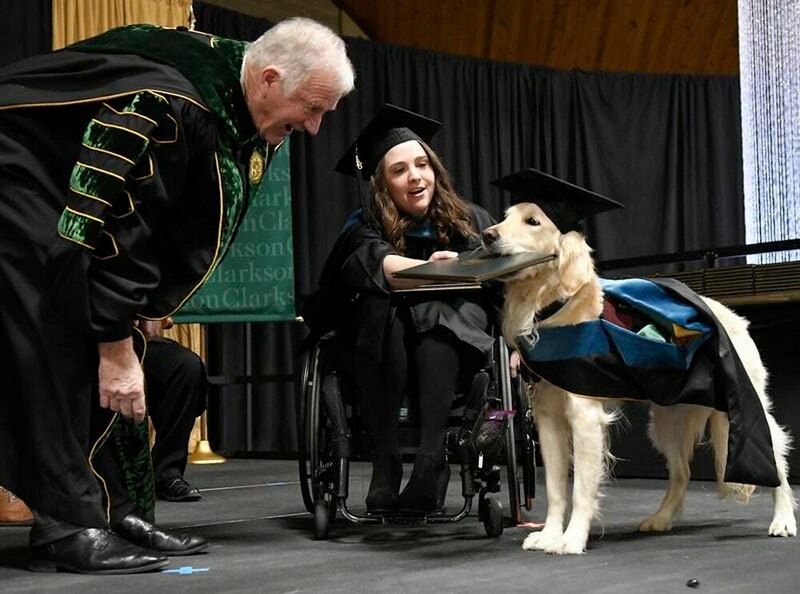 Golden retriever Griffin has been given an honorary diploma after his “extraordinary effort” as a service dog helped a 25-year-old through a masters degree. Britanny Hawley, who suffers from chronic pain and uses a wheelchair, completed her qualification in occupational therapy at Clarkson University and will get her certificate next month. Her four-year-old dog Griffin, who opened doors, turned on lights and fetched items, was honoured at the weekend and will accompany Ms Hawley into her future career. The board of trustees of the Potsdam, New York, school said Griffin demonstrated “extraordinary effort, steadfast commitment and diligent dedication to the well-being and student success” of Ms Hawley. Ms Hawley, of Wilson, North Carolina, said Griffin does a wide range of physical tasks for her including opening doors, turning on lights and bringing her items she indicates with a laser pointer. He also provides comfort amid her relentless, severe pain that causes anxiety and depression. She got Griffin through paws4prisons, a programme that teaches inmates at West Virginia prisons to train and place high-level assistance dogs. “The inmates allow many dogs to come up to you and let the dog choose you,” she said. Ms Hawley and Griffin worked at Fort Bragg in North Carolina during an internship, helping soldiers with mobility impairments as well as psycho-social disorders. Brushing a dog can help improve a patient’s range of motion, and stroking him helps ease anxiety, she said. When she applies for jobs, she and Griffin will be a package deal, Ms Hawley said.